JustBunkBeds expands its black and white wood bunk beds line with exciting new features just in time for the holiday shopping season. This is the best time to shop for a black or white wood bunk bed. JustBunkBeds today announced the release of a complete new line of black and white wood bunk beds for youth and adults. The latest introductions are available in twin over twin, twin over full, and full over full. Configurations allow JustBunkBeds to reach a broad cross section of consumers with compelling solutions when shopping for youth furniture. Among the latest release are the Gary white mission twin bunk bed, the Dillon black twin full bunk bed, and the Connor Mission Full Bunk Bed. Most new releases are available with under-bed drawers, under-bed trundle or a combo of both. JustBunkBeds stocks a wide variety of children’s furniture ranging from wood and metal loft beds, 5- drawer chests, student desks and nightstands. The finishes available are: natural birch, pecan, dark pecan, walnut, navy blue, black, white, and espresso. JustBunkBeds is able to showcase its product line ahead of the busy fall and holiday shopping seasons by communicating with today’s highly tech-savvy customers through a variety of social mediums such as Facebook, Twitter, and Google+. 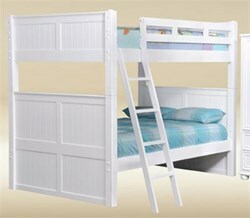 JustBunkBeds.com is one of the nation’s leading specialized bunk beds and loft beds online retailers. Launched in 2009, the ecommerce site is a complete source for bunk beds and loft beds. JustBunkBeds.com serves customers throughout the Unites States and Canada and has recently expanded its reach to other international markets.